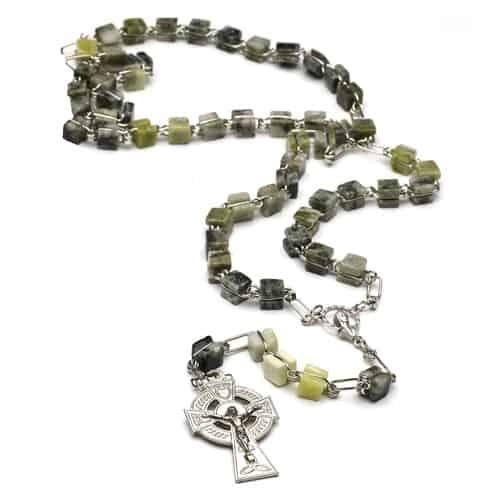 The green hills of Ireland are called to mind when you hold this beautiful Genuine Connemara Marble Rosary. Handcrafted in Ireland, the unique cubed marble beads showcase Connemara Marble’s various shades of green. Connemara means “of the sea” and comes from the Connemara Mountains in the most western parts of Ireland in County Galway. A Celtic crucifix completes the rosary. The rosary is constructed with an extra strong double link chain and measures 25″ long. Few things reflect the beauty of creation more strongly than the deep and varied greens of Connemara Marble, found only in a small corner of Ireland’s Atlantic seaboard. These Rosary Beads, handmade in Dublin from marble cut from a quarry in Co. Galway, are part of a long tradition in Irish Rosary beads. The first Irish Rosaries were made by monks of the great settlements like Cashel, Clonmacnoise and Glendalough. Using the horns of animals, they fashioned beads of natural beauty and simple strength. Their strength in particular put them much in demand in medieval Europe, where the rosary was a widely observed meditation, and personal link with the Creator. These beads continue that tradition, combining natural beauty with practical strength. Carry them with you, and tranquility will never be far away.